The TFS 500 model is part of the new ULMA TFS Thermoforming line. This is an entirely new machine design concept. 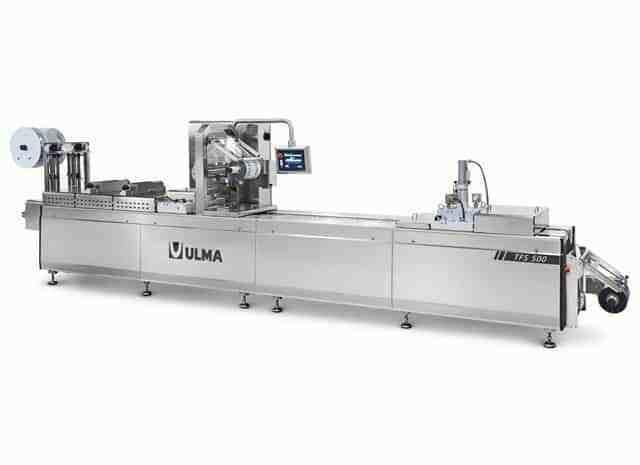 ULMA has redesigned every section of the thermoforming machine, to surpass the rigorous hygiene and deep cleaning requirements demanded by today’s food and medical packaging industry. The machine characteristics make it highly desirable for mixed production requirements since formats can be easily changed to meet the needs of the customer. It’s versatility, easy operation, and quick size change also makes it suitable as a support machine for short run products, capable of both flexible and rigid packaging up to 700μ. Entire stainless steel structure to AISI 304. Main frame length starting at 3600 mm. Inclined surfaces allow water to drain during cleaning. Easy open side guards, allowing the inside of the machine to be cleaned. Design that repels the accumulation of contamination residue. Sealed and continuous welds used in the fabrication process. Different types of lifting systems for the moulds are available. Top film reel holder independent of the cabinet. Components with protection level – IP 67 as standard. IP 69k option in dark zones. Minimised use of internal wiring. Independent main electrical cabinet (moveable). Optional MODEM (communication with ULMA) and OPC (real time access). – Easy operator communication interface (graphic display optional). Optional – change of package height and automatic adjustable mould opening.